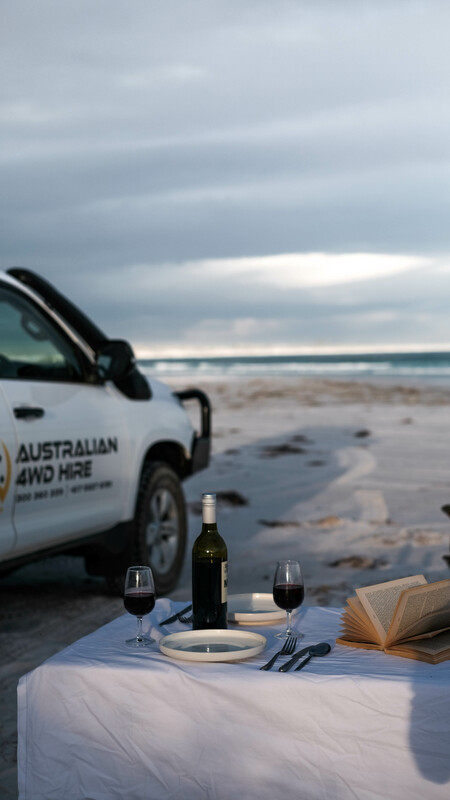 This article is in friendly collaboration with 4wd Hire Australia. I always search for my flights via google flight search and skyscanner. It depends on the season, but you can find flights from Germany to Perth for about 500 €. If you’re already on the road, then you will some cheap flights from Singapor, Bangkok, Bali or Dubai to perth. That’s what I found: from Dubai to Perth for 300 € including luggage. 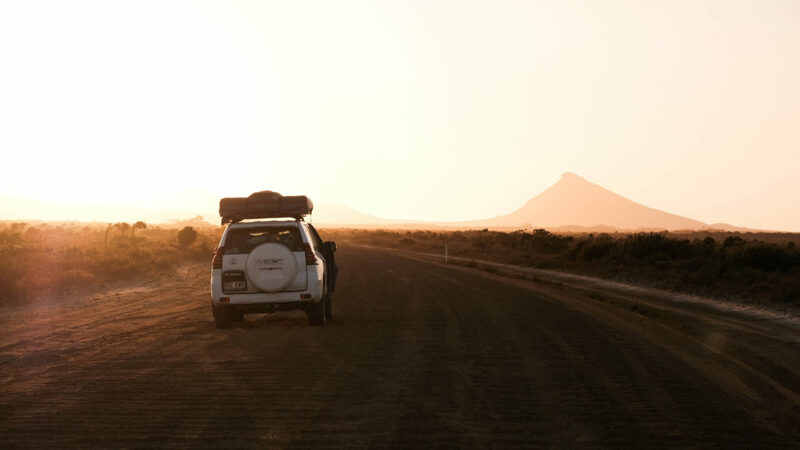 If you’re planning a holiday and road trip for 3 to 4 weeks it won’t be worth to buy a car. So you’re choice would be a rental car. 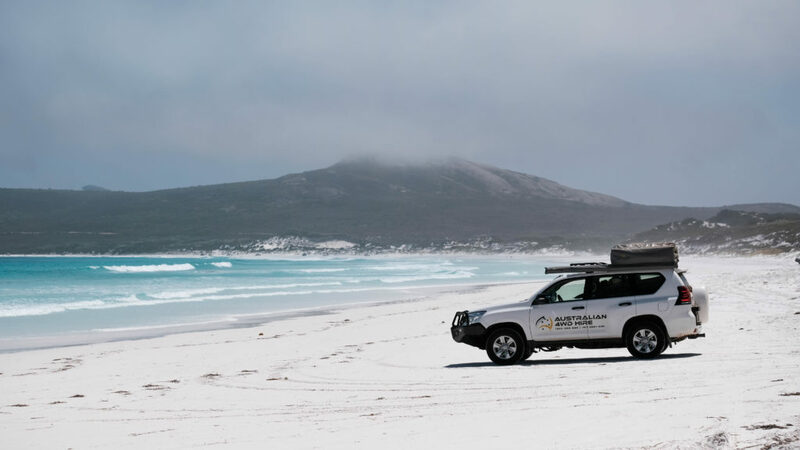 The untouched nature and landscape in western Australia is breathtaking and to reach every hidden gem I would recommend to rent a four wheel drive. That’s why we rented a 4×4 Toyota with a rooftop tent. We reached remote areas and beaches with this car and found the most beautiufl free campsites which were only achieved with those SUVs. Our car was completed equipped with camping chairs, camping table, fridge, camping cooker, tools, water canister and the rooftop tent. Honestly, the mattress was quiet hard and after 3 weeks I felt my back. Due to hygienic reasons, they also do not supply sleeping bags or bedding. You need to bring their own, alternatively there are plenty of camping supply outlets close to their pick-up location where you can purchase new and clean sets. We found some really good and cheap staff at a charity shop in Perth. We booked our car via australian4wdhire.com.au for a small amount in exchnage for some content. I would recommend to drive around 100 – 150 km a day. You won’t be in the car for more than 1 hour a day and will have enough time to explore the beautiful nature. Or you drive a longer distance straight to spend more days at one place. We started in perth and headed straight via Hyden (Wave Rock) to Esperance. We took 2 days for that and then travelled to Bremer Bay, Albany, Denmark to Margaret River and back to Perth. But I will publish a full route plan with all my tips soon. I highly recommed you to download the following apps: WikiCamps (it’s a free version for the first 14 days and then it costs $ 5) and CamperMate (it’s free, but not that detailed as WikiCamps). For me CamperMate was enough. You can set a filter and select toilets, free showers, tourist attractions and the most important thing campsites and FREE campsites. We just used the free campsite during the whole trip, which is good when you’re travelling for a longer time or on a small budget. If you need to take a hot shower, just ask at other campsites for a shower. Usually you need to pay around $ 3 – 5. We bought a Telsta SIM card for 12 $ and got around 30 GB data. That’s why we always used our iphone maps for navigation. Australia is a bit more expensive then Europe in general. Especial the places and villages far away from the next bigger city are more expensive. That’s why I would recommend to do a huge shopping when you arrive in Perth. Especially ALDI is super cheap when it comes to noddles, beans, rice, olive oil, oats, almond milk…. As I alreay mentioned, a good way to shop cushions and beddings are second hand shops as well as Kmart and BigW. Also the wine is affordable for around $ 5 – 6. We used to cook by ourselves almost every day and we didn’t spend any money for eating in a restaurant during our trip. but you need to plan a bit more time for cooking when you just have one camping cooker. Breakfast: Oats mixed with granola, banana, nuts and topped with peanut butter. Filled up with oat- almond or coconut-milk. Or a hot porridge with apple slices, peanut butter and nuts. Dinner: Pasta with tomato sauce – the classic. Or salad wraps. Just use the salad to wrap guacamole, tomato, humus, corn and kidney beans. We also love to cook curry with rice, lentils and chickpeas.